With four Electoral College votes up for grabs in a tight presidential election, New Hampshire is back in the national spotlight. And with a heated US senate and governors race, the Granite State is dealing with candidate overload. "I want to see less of the politicians and more of action,” says voter Monish Roy. The candidates along with their surrogates are making last minute stops in the key battle ground state before the election. And even for some who are used to the politics, it's a little too much. "It gets to a point now, I wish it was over. There is too much everywhere," says voter Renaud Gagne. New Hampshire's gubernatorial candidates were on the campaign trail Sunday making their final pitch to voters. Republican Chris Sununu and Democrat Colin Van Ostern spent the day going to many events and door-to-door. But Derry Republican Party chairman Jim MacEachern says many voters here may still be undecided about the candidates and need more convincing. "You’re not going to win an election in New Hampshire by putting in ads in the paper or ads on T. We have to meet you here we have to vet you," says MacEachern. Stopping by the key battle ground state is a rite of passage for most politicians. But some voters say at this point, the candidates have already been grilled, and voters now have enough political food for thought. On Sunday, Republican Sen. Kelly Ayotte first spoke in MaryAnn's Diner in Derry, where she was pressed about GOP presidential candidate Donald Trump. Ayotte once supported Trump without endorsing him, then rescinded her support. She said she has problems with Trump but can't vote for his Democratic opponent, Hillary Clinton. "I will be independent voice to stand up to people nh focus getting results for state I have one of the most bipartisan records," Ayotte said at another stop in Manchester. 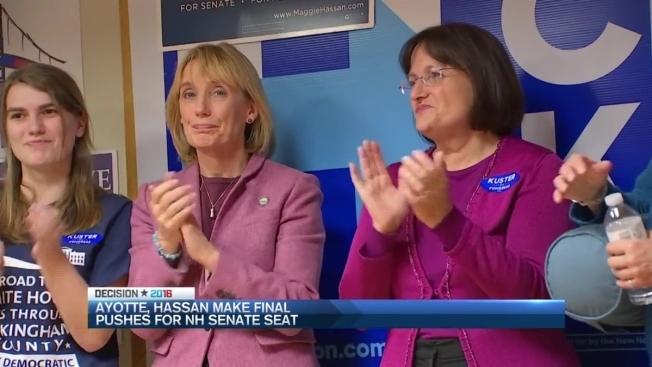 Ayotte's Democratic opponent, Maggie Hassan, campaigned Sunday evening with Clinton. Hassan started her day by attending several canvass kickoff events with other Democrats. "At the end of the day this election is about if we’re gonna put New Hampshire first," Hassan said at an event in Salem. Both candidates have busy schedules leading right through Election Day. The outcome of their tight race will help determine control of the U.S. Senate, and outside groups have poured more than $100 million into the state. In the governor's race, Republican Chris Sununu made the rounds with Ayotte on her bus. He also greeted voters at the Market Basket in Epping. "I want to look them in the eye let them know they can trust me," Sununu said. 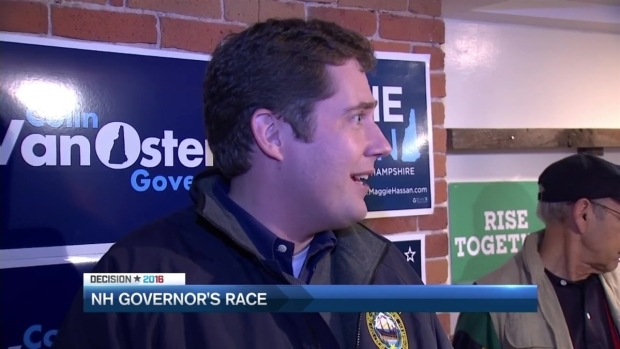 The son of former New Hampshire Governor John Sununu, he's trying to convince Granite Staters he’s the one for the job. "We have been living in Trump’s reality show for a year and a half and Tuesday is the chance to change the channel," he said. Meanwhile, Democrat challenger Colin Van Ostern helped kick off a canvassing event in Hampton Sunday evening, sending hundreds of volunteers out to knock on doors. One of those volunteers was 9-year-old Jacob Eckert of Belmont, Massachusetts.